The most important quality of Maelstrom Women’s Tac Force 8 boots is its leather, which is water-resistant. Nylon upper that comes with a liner that wicks moisture. Sweat is drawn to the exterior because of the moisture-wicking part is designed in a way so that the drops of sweat roll off easily. The boots are tough and will stay dry even when you trek through soggy mud or deep puddles. Easy and quick to wear and remove because of the ties at the front and the zipper on its side. Its padded collar and tongue provides a gentle comfort. Some complaints about discomfort because of the wrong size, so make sure to measure your feet carefully before purchasing. Water-resistant but not fully waterproof. There are some pairs where water gets into the boot easily. Maelstrom Women’s TAC FORCE 8 work boots are the perfect mix of quality and affordability, and is considered as one of the ideal work boots available in the market today. This is the perfect pair of boots for any individuals in the field of military, law enforcement and any type of job that needs alertness on their feet. It is specially designed to fit the needs of these individuals in mind. It stands out from other laced combat boots since it features a side zipper so that you can quickly and simply remove them. Aside from this, you can also put the shoes back on whenever you are in a hurry or when you simply don’t feel like fastening your shoes. The Maelstrom Women’s Tac Force 8 is the best choice for any professional female in uniform and outdoor enthusiasts who are after lightweight, performance as well as comfort. These boots feature woman-specific shoes last for maximum comfort and fit. The upper portion of the Maelstrom Women’s Tac Force 8 combines resistant to water nylon and leather materials. Also, antibacterial and extremely breathable moisture-wicking liners are added to fully enhance its moisture management system. This ensures that your feet are kept dry and cool all throughout the day. These tactical boots features a shock-absorbing midsole and insole systems that are lightweight. This ensures a maximum support for high impact activities with greater density and rebound which results in speed, comfort and stability. The Maelstrom Women’s Tac Force 8’s cushioning system sits on top of a slip and oil-resistant outsole, which is precisely developed by the company to give users of this boot traction in all types of terrain. Furthermore, it comes with a side zipper for an easy and fast on and off. The Tac Force 8 is intended to be lightweight, fast and comfortable and integrated a cutting-edge athletic design features, process as well a traditional construction for durability and great value that has been proven. Without any break in time needed, you can wear these boots right out of the box. The Maelstrom Women’s Tac force 8 is built for flexibility. The boot’s cemented construction which held it together is not only sturdy which keeps the boots together, but it also offers further flexibility over double stitched boots. The composition of its midsole is also crafted with consideration to flexibility. These tactical boots are built to be comfortable. It features an enjoyable fit thanks to the padding in the collar and tongue. This makes it easy to wear during long working hours. Additionally, the leather and nylon combination makes its upper portion water-resistant to keep your feet dry. Its liner not only will keep you dry because of its moisture wicking material, but it’s also design in a way to keep bacteria from building up even when your feet are sweating for an extended period of rigorous activity. The midsole not only cushions your feet, but it also reduce the force of the foot when it hits concrete. This will result in preventing wear on your ankle and knee joints. The outer piece that’s made of leather can be polished and cared for so that they will stay intact for a long period of time. The cemented construction used on the Maelstrom Women’s Tac Force 8 is a rigorous process that ensures the boots will not unravel unlike their numerous competitors in the market today. Most often, this kind of process increases the tag price of performance boots, which just adds to how impressive the price of these boots is. The Tac Force 8 applies a tactical construction. These boots comes with a lightweight material for heightened speed, robust rubber outsole to increase traction and a zipper for easy and fast access. This will save you valuable time whenever you’re in a rush. Also, you will not be slowed down because of how lightweight these Maelstrom Women’s Tac Force 8 boots are. Finally, the sturdy rubber outsole will ensure that you will be able to move even when you’re on slippery surfaces. These boots are always ready for you when performance counts. Q: Does it have ankle protection? A: Yes. You can jog on gravel and do push ups with it. It can also survive 8 hours on your feet, right out of the box with no breaking period. Q: Is this recommended for hiking? A: This is more of a hiking boot than a hiking boot. Q: Can these be put on quickly? A: Yes, they have a side zipper so you can simply shove your foot in and zip them up. If you have slim feet, adjust the lace properly to limit the little wiggle room on the sides. New shoes are not yet polished; in order to protect your new shoes, use a shoe polish to wipe the soles seam portion to strengthen the water-resistant effect. In order to get the perfect size, make sure to measure your feet first using a tape measure. 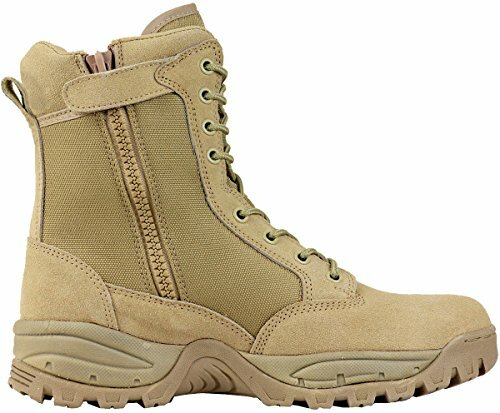 The Maelstrom Women’s Tac Force 8 boots is made and designed for women in uniforms in mind. However, it can most definitely be used by any woman. Whether you are a construction worker or a student who wants to make an edgy fashion statement, you can still find this pair of boots very beneficial. Bottom line is, these Tac Force 8 boots are made especially to help you get the job done.